Hello and happy Friday! The kids have been on half-term so this week has flown by! I thought I’d sneak in with a card that I have made for an impending birth! We know it’s going to be a boy but I think this colour way would be suitable for both a girl or boy. To make this I used the following: Bear topper from Lili of the Valley, DCWV – Nana’s Nursery- Baby Boy, gingham cardstock, Bazzill cardstock, WRMK Corner Chomper, Craftwork Cards die-cut sentiment, Epiphany Star tool, X-Cut Star Embossing Folder, gingham ribbon and a Sizzix Scalloped Border Die. Next > Mother’s Day Montage…. Darling little bear in the scales…how CUTE! And, love the colors in green and the purple gingham…very pretty! It is absolutely precious! These colors are perfect and the papers are a great fit! This is the cutest, Karen. The image, the papers – everything fits so nicely together ! 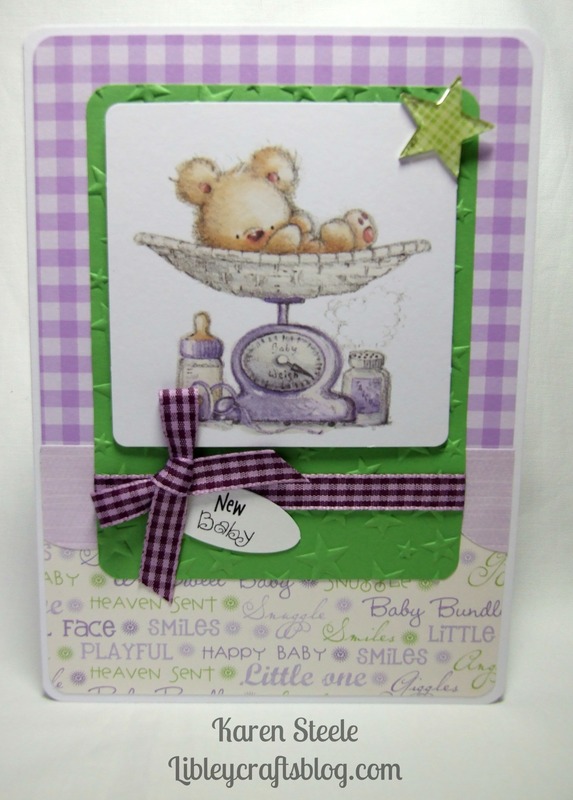 I’ve never thought of using purple and green for a baby card, but it works, and for both boys and girls. I’ve stuck to yellow when I don’t know what it will be, but this is a great alternative I’ll think of next time I need to make one. Love these cute LOTV images.